Put the Battle of Kettle Creek in perspective with today’s MapMaker Interactive map of key Revolutionary War battle sites in Georgia, and put the entire “Southern Strategy” in perspective with a larger map of the war. Most cadaver dogs are Labrador retrievers or German shepherds, but the breed of dog is usually less important than qualities such as a good hunt drive, strong nerves, and confidence. 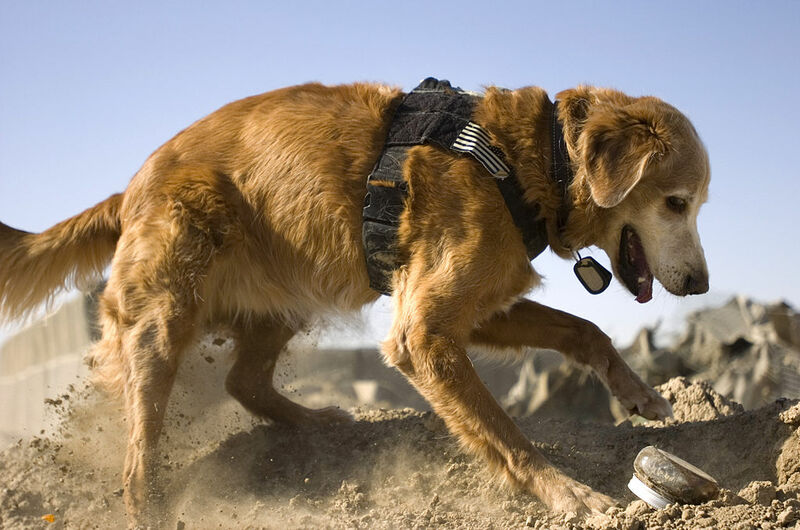 Here, golden retriever Rudy searches for clues on a training exercise at Camp Victory, Iraq. Why do you think most key Georgia battles took place around rivers and ports? The Fox News story explains how amateur historians used cadaver dogs to help identify possible burial sites for Patriot and Loyalist forces killed at the Battle of Kettle Creek, Georgia. What are cadaver dogs? Skim this terrific Guardian article for some help. Cadaver dogs are dogs that have been specially trained to identify human remains. In fact, they’re also known as human remains detection (HRD) dogs. Training to be a cadaver dog is intense. It takes between 18 and 24 months for most dogs to be fully trained. Who were the Patriots and Loyalists? Patriots were colonists who rebelled against the British during the Revolutionary War. Patriots were also known as Continentals, Rebels, and Revolutionaries. Patriots, led by General George Washington, won the Revolutionary War and secured independence for the United States. Loyalists were colonists who supported continued British rule during the Revolutionary War. Loyalists were also known as Tories. What happened at the Battle of Kettle Creek? Skim this article from the National Register of Historic Places for some help. We often think of the Revolutionary War as a New England conflict. It was not. The Battle of Kettle Creek was a key victory for Southern Patriots during the Revolutionary War. Acting on what turned out to be faulty information, Loyalist leaders marched from British-held Savannah and Augusta to rendezvous with allies on the banks of Kettle Creek, to the northwest. Loyalist sympathizers were not at Kettle Creek, but revolutionary Patriots were. A force of about 400 Patriots defeated a Loyalist force more than twice that size. Alerted by hints from the cadaver dogs, archaeologists investigated land around the Kettle Creek Battlefield historic site. How did they analyze the area? Archaeologists excavated five sites by hand and by using ground-penetrating radar. What did archaeologists find at the site? This was enough to help the Kettle Creek Battlefield Association secure federal money to expand the site from 77 to 257 acres. Kettle Creek was one of 32 sites to receive a Battlefield Land Acquisition Grant last year. Map the rest with this list, and learn more about the program here.